Pallet mold can be controlled by restricting moisture and food sources. 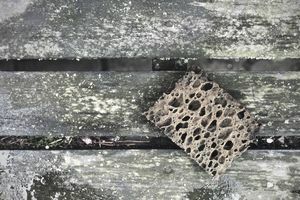 Mold on pallets is a common problem, one which is coming increasingly under scrutiny as food safety requirements continue to become a priority. As a pallet manufacturer or a pallet user, it is important to keep pallets dry. What Effect Does Mold Have on Wood Pallets? In order for mold to grow, the appropriate conditions are required. Mold needs oxygen, a food source, and moisture. In any strategy to inhibit the growth of mold, one of these three ingredients must be restricted. According to John Shawyer, Director of UK-based Associated Pallets, pallets can act as something of a breeding ground if they are left untreated. This causes softening, decay and ultimately decreases the life expectancy of the pallet, not to mention raising the possibility of food safety concerns. As food safety requirements increasingly come under the radar, an increasing number of pallet customers expect their pallets to be treated before purchase to inhibit the onset of mold. A surprise to many, mold spores are in the air around us almost all the time. They are just looking for the perfect place to breed and your wood pallets are a tempting place to do that. Mold inhibition strategies are designed to ensure that your pallets do not offer the opportunity for mold to form. Wood pallets are frequently heat treated as part of the ISPM 15 program. While this treatment kills wood borne insects, it does not prevent the growth of mold. Do not be fooled into thinking that heat treating is an effective mold deterrent, Shawyer cautions. Yes, it will get rid of any wood pests that burrow into wood packaging, but it will not really have any impact on mold growth. In fact, it can even promote it. Here is how that happens. Heat treatment can draw moisture and sugars in the wood to the surface. Once the pallets are removed from the heat chamber, an ideal environment has been created for mold spores to colonize. One leading product, X-Mold, works on the basis of sealing the wood from oxygen. It creates a barrier that prevents oxygen from being accessible for mold colonization. Other chemical treatments are copper formulations or those that act as moldicides, which inhibit mold growth. Given the range of environmental conditions that a pallet supplier can encounter, it is prudent to review your application with a provider and perform testing. The effectiveness of chemical applications can range from a few weeks to as much as 90 days, depending on the situation. Removing the moisture is another option to keep mold from establishing on wood pallets. The use of kiln dried lumber in pallet manufacture, and subsequently keeping those pallets dry is an effective approach. Other strategies include the use of heavy-duty fans and specially created vents which can dry the product to below 20 percent moisture – the magic number as far as mold deterrent is concerned. Purchasing pallet material that has been kiln dried and ensuring air flow through green material. A strategy of quickly turning inventory will prevent lengthy storage that could lead to mold development. Store pallet material and finished pallets under cover to keep pallets dry and less susceptible to mold. Once pallet users have purchased new pallets, they benefit from taking care not to expose them to any unfavorable conditions. As mentioned above, treatments are effective for only a limited period, so everyone who uses the pallets needs to mindful of keeping wood pallets dry. Mold Prevention. National Wood Pallet & Container Association. 2015. Mold on Wood Pallets: Prevention Strategies. 2018. Mold and Pallets. National Wood Pallet & Container Association. 2013. Drying Pallets and Keeping Them Dry Helps Prevent Mold. Pallet Enterprise Magazine. August 2007. The Mold Hard Truth. Nelson Company Blog. July 2013.